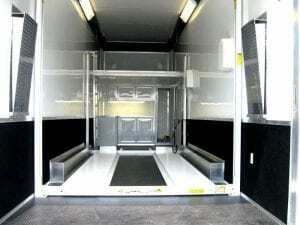 Stacker car trailers are car trailers that allow cars to be loaded on a lower and upper deck. These trailers include a lift in the trailer which allow cars to be raised to the upper level. Stacker trailers come in both gooseneck and bumper pull models. Bumper pull models generally allow for 2 cars, while the gooseneck models can hold as many as 3 cars. 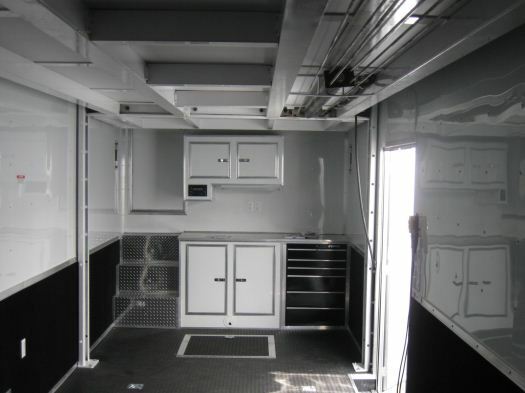 Most stacker trailers come with tie down systems, finished interior and cabinets. Stacker trailers are generally pulled with a large motor home, semi-truck, Ford F-650s or Chevy 6500. 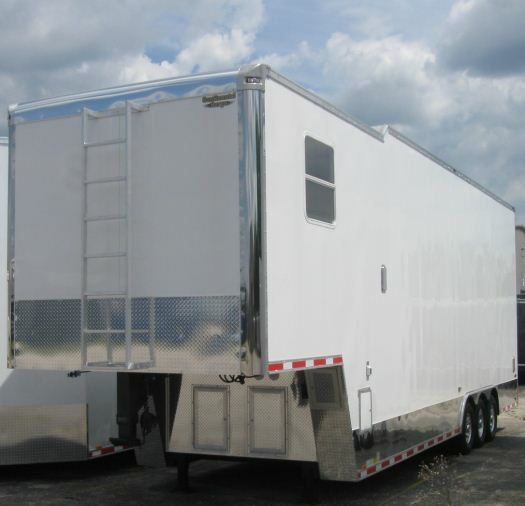 These trailers are an ideal product for transporting multiple cars in a enclosed trailer. 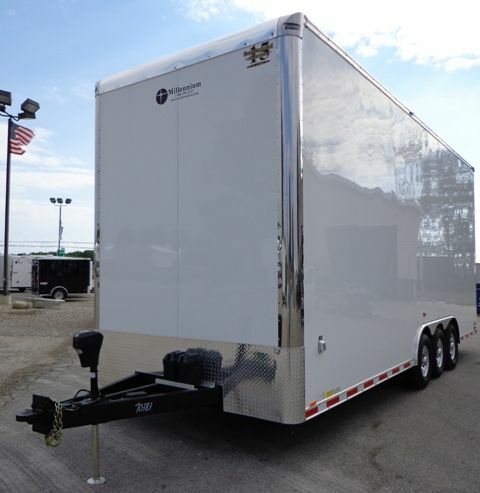 Millennium Trailers offers multiple brands to service out clients needs. We offer goose neck, fifth wheel and bumper pull stacker trailers. You can also browse our stacker trailers for sale. Most options that are in a normal trailer are also available in stacker trailers. Generally speaking these trailers will be triple axle trailers. For cosmetic purposes you may choose an exterior without fasteners. It is also wise to add on a power assist jack which would be either an electric or hydraulic jack. The reason for this is simple, your stacker trailer (even more so when loaded) is very heavy and turning a normal jack would be very difficult. Other options that are common are generators, 110v electrical packages, cabinets, ramp extensions to load vehicles with low clearance and electric winches. There are hundreds of options and the best way to get the stacker trailer that you need is to speak with a Millennium Trailer’s design specialist. In order to get a car on to the upper level of the trailer, some type of electric & hydraulic lifting system is required. The two main systems are to put a car lift similar to the one found in a garage and the other is a lift gate. The most common lift type in a stacker trailer is a stinger lift that is inside the trailer. Stinger lifts come in 6 sizes: 10 feet, 13 feet, 14 feet, 16 feet, 18 feet, 24 feet. The stinger lifts are powder coated and designed for cars and heavy use. The lift can be bought for a 6,000# capacity on a #4,000 capacity. A 12V systems drives the lift up an down.When fully raised the lift allows for 80″ clearance and has Drings to a tie down a car. The stinger lift is a great and economical way lift cars up and stack them in a trailer. Lift gates are mechanical devices that lay flat on the ground, allowing the user drive the car on to the lift. The lift is then raised and the car is either driven or winched on to the upper or lower deck. 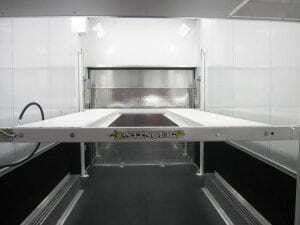 The lift gate generally weighs less and is more desirable than a lift inside the trailer. Choosing the best lift for you can change the functionality and usability. Give this area serious consideration.